In anticipation of the expiration of the Collective Bargaining Agreement (CBA) between the petitioner and the respondent Pilipinas Shell Petroleum Corporation, the parties started negotiations for a new CBA. After several meetings on the ground rules that would govern the negotiations and on political items, the parties started their discussion on the economic items. The union proposed a 20% annual across-the-board basic salary increase for the next three years that would be covered by the new CBA. In lieu of the annual salary increases, the company made a counter-proposal to grant all covered employees a lump sum amount ofP80,000.00 yearly for the three-year period of the new CBA. The union requested the company to present its counter-proposal in full detail, similar to the presentation by the union of its economic proposal. The company explained that the lump sum amount was based on its affordability for the corporation, the then current salary levels of the members of the union relative to the industry, and the then current total pay and benefits package of the employees. The union lowered its proposal to 12% annual across-the-board increase for the next three years. For its part, the company increased its counter-proposal to a yearly lump sum payment of P88,000.00 for the next three years. However, the union remained unconvinced and asked for additional documents to justify the company’s counter-offer. Alleging failure on the part of the company to justify its offer, the union manifested that the company was bargaining in bad faith. The company, in turn, expressed its disagreement with the union’s manifestation. After several negotiations, the company proposed the declaration of a deadlock and recommended that the help of a third party be sought. The union replied that they would formally answer the proposal of the company a day after the signing of the official minutes of the meeting. On that same day, however, the union filed a Notice of Strike in the National Conciliation and Mediation Board (NCMB), alleging bad faith bargaining on the part of the company. The NCMB immediately summoned the parties for the mandatory conciliation-mediation proceedings but the parties failed to reach an amicable settlement. During the cooling off period, the union conducted the necessary strike vote. The members of the union, who participated in the voting, unanimously voted for the holding of a strike. Upon being aware of this development, the company filed a Petition for Assumption of Jurisdiction with the Secretary of Labor and Employment. The Secretary of Labor and Employment granted the petition of the company. The union contended that the issue is the unfair labor practice of the company in the form of bad faith bargaining and not the CBA deadlock. Anchoring its position on item 8 of what the parties agreed upon as the ground rules that would govern the negotiations, the union argued that, at the time the Assumption Order was issued, there was no CBA deadlock on account of the union’s non-conformity with the declaration of a deadlock, as item 8 of the said ground rules provided that a "deadlock can only be declared upon mutual consent of both parties." Thus, the Secretary of Labor and Employment committed grave abuse of discretion when she assumed jurisdiction. The union insists that the corporation is guilty of unfair labor practice through bad faith bargaining. According to the union, bad faith bargaining and a CBA deadlock cannot legally co-exist because an impasse in negotiations can only exist on the premise that both parties are bargaining in good faith. Besides, there could have been no deadlock between the parties as the union had not given its consent to it, pursuant to item 8 of the ground rules governing the parties’ negotiations which required mutual consent for a declaration of deadlock. Is there absence of good faith on the part of the respondent, Pilipinas Shell Petroleum Corporation? No absence of good faith on the part of the company. 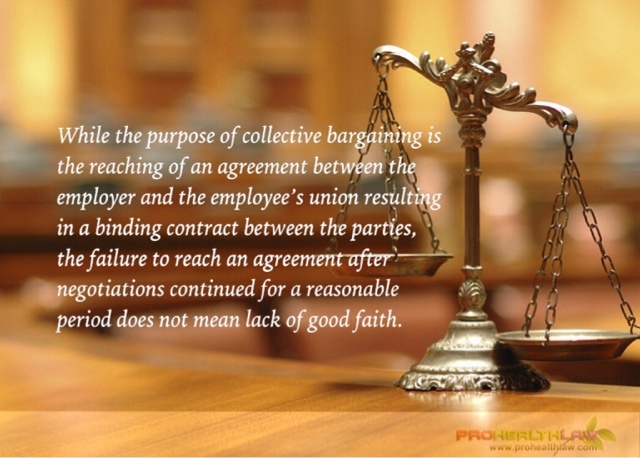 While the purpose of collective bargaining is the reaching of an agreement between the employer and the employee’s union resulting in a binding contract between the parties, the failure to reach an agreement after negotiations continued for a reasonable period does not mean lack of good faith. The laws invite and contemplate a collective bargaining contract but do not compel one. For after all, a CBA, like any contract is a product of mutual consent and not of compulsion. As such, the duty to bargain does not include the obligation to reach an agreement. In this light, the corporation’s unswerving position on the matter of annual lump sum payment in lieu of wage increase did not, by itself, constitute bad faith even if such position caused a stalemate in the negotiations. As there was no bad faith on the part of the company in its bargaining with the union, deadlock was possible and did occur. The union’s reliance on item 8 of the ground rules governing the parties’ negotiations which required mutual consent for a declaration of deadlock was reduced to irrelevance by the actual facts. Contra factum non valet argumentum. There is no argument against facts. And the fact is that the negotiations between the union and the company were stalled by the opposing offers of yearly wage increase by the union, on the one hand, and annual lump sum payment by the company, on the other hand. Each party found the other’s offer unacceptable and neither party was willing to yield. The company suggested seeking the assistance of a third party to settle the issue but the union preferred the remedy of filing a notice of strike. Each party was adamant in its position. Thus, because of the unresolved issue on wage increase, there was actually a complete stoppage of the ongoing negotiations between the parties and the union filed a Notice of Strike. A mutual declaration would neither add to nor subtract from the reality of the deadlock then existing between the parties. Thus, the absence of the parties’ mutual declaration of deadlock does not mean that there was no deadlock. At most, it would have been simply a recognition of the prevailing status quo between the parties. The union is wrong. As discussed above, there was already an actual existing deadlock between the parties. What was lacking was the formal recognition of the existence of such a deadlock because the union refused a declaration of deadlock. Thus, the union’s view that, at the time the Secretary of Labor and Employment exercised her power of assumption of jurisdiction, the issue of deadlock was neither an incidental issue to the matter of unfair labor practice nor an existing issue is incorrect. TABANGAO SHELL REFINERY EMPLOYEES ASSOCIATION, Petitioner, vs. PILIPINAS SHELL PETROLEUM CORPORATION, Respondent.